Brandon Tufford, right, accepts the Athlete of the Meet trophy at the 2018 Rick Scott Open Track meet at the Crosslink Sportsplex. Also, pictured are meet director Bill Corcoran (right) and Leftover Mylar Party Balloon (centre). Party Balloon placed second in the 800m. Previous Rick Scott Open’s have featured many stellar performances over the past six editions. However, Brandon Tufford’s 800m race on Saturday, put all previous awesomeness displayed by former RS Open athletes to shame. Tufford, a 17 year old GP Comp student, obliterated the Crosslink Sportsplex facility record for 800m by recording a time of 2:10.3. He was chased to his record time by a Leftover Mylar Party Balloon and teammate Chris Neilson. The Party Balloon clocked 2:10.4, while Neilson stopped the time at 2:11.1. For his efforts, Tufford was awarded the Overall Athlete of the Meet trophy. Wolves Cross Country runner Brandon Wladyko also registered notable performances by winning both the 2000m and 300m. Wladyko’s 300m race was particularly impressive as he blew by 2-time world, 5-time national, and 10-time provincial champion Kyle Reynolds Ba-beeee! in the final few metres. Wladyko was named Male Athlete of the Meet. The Female Athlete of the Meet went to another Wolves Cross Country runner, Kelcie Bulas. She placed first among the women in the 1500m and second in the 300m. 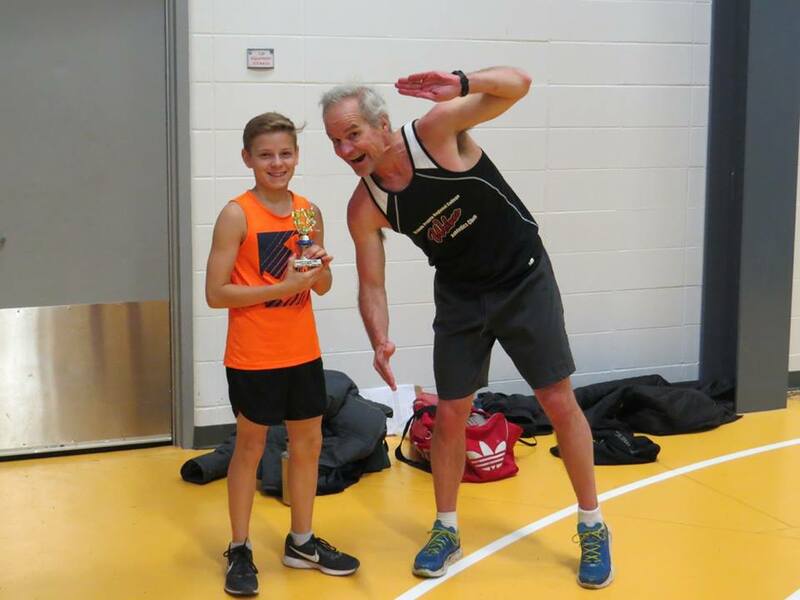 In a controversial call, Grade 7 phenom Jacob Farnsworth, who placed 4th in the 800m, was presented with the Masters Athlete of the Meet. When Inspirational Figurehead and Assistant Meet Director Rick Scott was asked about why a 12 year old won the top prize for 40 and over athletes, Scott responded, “The kid had a good run. And besides, my meet; my rules!” At press time, the decision was still under appeal. Next up for the varsity Wolves indoor track team is ACAC #1 – The MacEwan Open in Edmonton on January 27 … a meet that features a real track, sanctioned officials, and prizes which aren’t recycled minor hockey trophies. 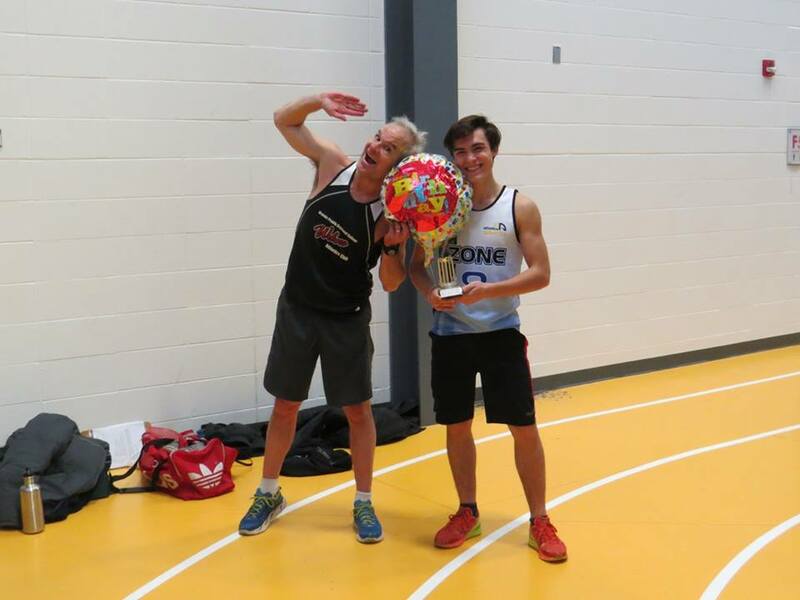 This entry was posted in Indoor Track and Field and tagged Brandon Tufford, Brandon Wladyko, Crosslink Sportsplex, Grande Prairie, Indoor Track and Field, Kelcie Bulas, Peace Country Wolves Athletics Club, Wolves Athletics Club. Bookmark the permalink.